Wheeler also worked with Niels Bohr in explaining the basic principles behind nuclear fission. 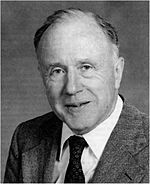 John Archibald Wheeler (July 9 1911 – April 13 2008) was an American theoretical physicist who was largely responsible for reviving interest in general relativity in the United States after World War II. He is also known for having coined the terms black hole quantum foam and wormhole and the phrase "it from bit".